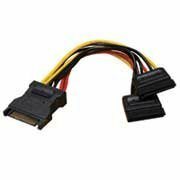 ›6-inch SATA Power Y Splitter, 1 male to 2 female. 6-inch SATA Power Y Splitter, 1 male to 2 female. It will use your existing SATA power connector, and give you one extra one SATA power connecotor. Just like the old Molex Y Power Splitters, but for SATA Power.